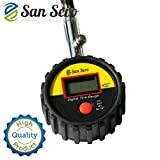 #1 Digital Tire Pressure Gauge: Best Selling - suitable for Motorbike, Car, Jeep, Van, Bus or Truck - Rated to measure tire pressure to up to 150psi / 10KG per CM² - Designed in a LIMITED EDITION High Visibility Yellow / Black & Red Design, encased i (UPC 820103765640) is sold at the following online stores. We've find the latest prices so you can compare prices and save money when making your purchases online. Please click on the links below to browse to each store's webpage.